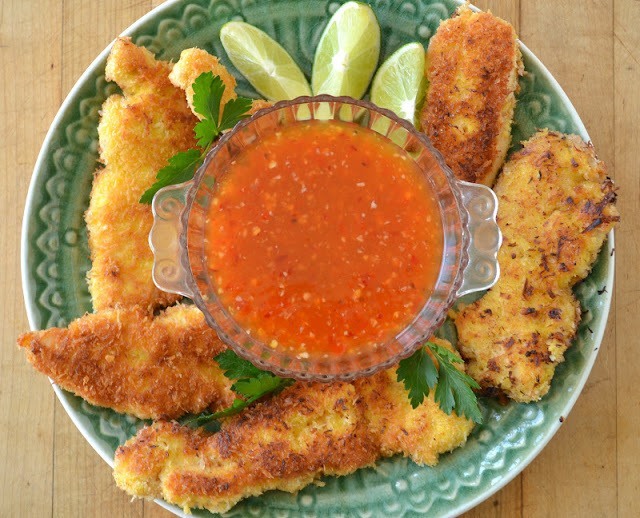 Coconut Chicken with Sweet Chili Dipping Sauce ~ this 30-minute family meal is guaranteed to be a huge success. Serve it as an appetizer, too! For the chicken: In a series of 3 plates or wide shallow bowls, set out the flour in one, the beaten eggs in another, and the bread crumbs mixed with the shredded coconut in the third. Coat all the tenders in the flour and set aside on a plate while you begin heating the oil in a wide bottomed frying pan. You should have about 1/8 inch of oil and it should be nice and hot before you begin cooking. When the oil is hot, dip the tenders in the egg, coating them completely, and then into the crumb/coconut mixture. Make sure you get them completely coated with the coconut crumbs. Shake off the excess. Saute the chicken until golden on both sides, which will take about 4 minutes total, depending on the thickness of your tenders and the temperature of your oil. Do this in batches so the tenders have space between them and the oil stays hot. Replenish with more oil if you need to between batches, but let it come up to temperature before adding more chicken. Serve with a squeeze of lime and the Chili Sauce. Mix the cornstarch and the 2 Tbsp water in a small bowl and set aside. Put all the rest of the ingredients in a small food processor or blender and blend until pureed. Transfer to a small saucepan and bring to a boil over medium high heat. Let simmer for 4 minutes. Add the cornstarch paste, stir and let simmer for another minute. The sauce will thicken and turn glossy. Let cool completely before storing in the refrigerator.